UFO SIGHTINGS DAILY: USS Enterprise UFO Seen Near Earths Sun On NASA Images Jan 3, 2016, Video, UFO Sighting News. 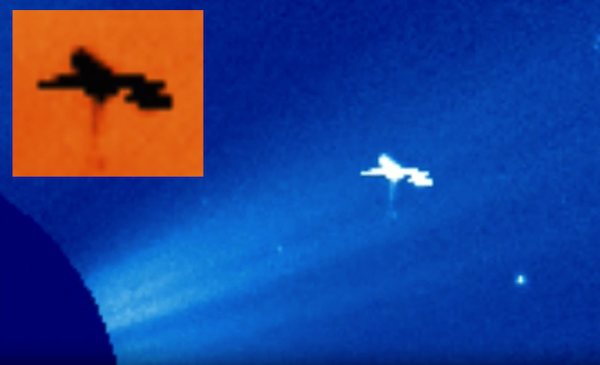 USS Enterprise UFO Seen Near Earths Sun On NASA Images Jan 3, 2016, Video, UFO Sighting News. This UFO was near the sun this week and something amazing about it is that not only is it huge, but it has a visible steam of energy leaving its bottom. The craft silhouette looks similar to the side view of the USS Enterprise. This ship is as big as Earths moon. Compare the size of it with the size of the radius of the sun...I'm being conservative here. The size indicates its several times bigger than Earth, but I believe that the distance is closer to the SOHO satellite and that his craft is being used to harvest a rare energy particle from our sun. Awesome catch by TheWatcher252 of Youtube.